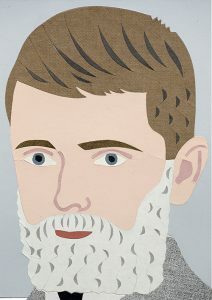 Luxuriant beards sprout from the chins of Gavin Hurley’s pink-faced boy portraits in the exhibition Beards, Boys, Platters, Shattered Dreams at the Sarjeant Gallery. A large table displays Sam Mitchell’s quirky ceramic take on the 1980s through Delft blue patterned platters, commemorating aspects of New Zealand and Whanganui history. Pottery cassette tapes, wicked red lions and other creatures – ET, an opium eater, a unicorn and a colourful bust of Whanganui born composer, Douglas Lilburn pop up among the platters. Mr Hurleys’ bearded boys represent local male characters and find particularly exuberant expression in portraits of pioneer Whanganui photographer, William James Harding and poet James K. Baxter – “there are some people you just can’t ignore,” Mr Hurley says. A wall spread features sixty-one moustachioed postcards, one for every day of his residency. He bought the cards, second-hand at Curiosities, a shop now closed, and embroidered the moustaches in the formal style of earlier times. Using a method similar to rug hooking Mr Hurley loops and re-loops the cotton hair, of which he has very little himself, through perforations. Both artists enjoyed their time in Whanganui immensely. 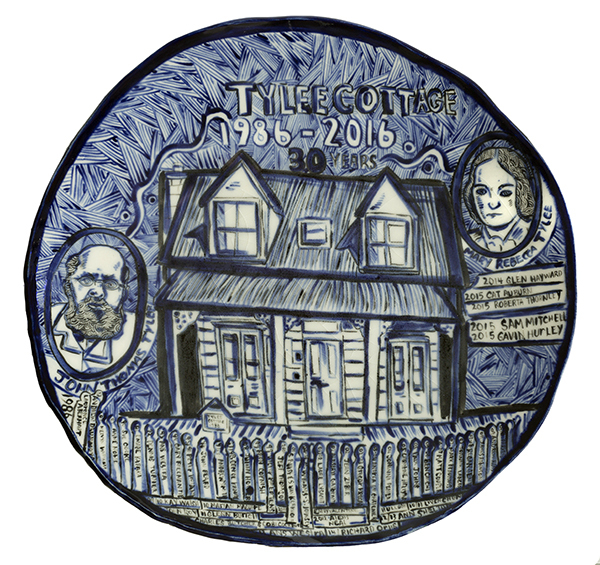 One of Ms Mitchell’s platters commemorates 30 years of the Tylee Cottage residency, 1986 to 2016. A fence post on the platter is named for every Tylee Cottage resident artist since the inaugural artist, photographer Laurence Aberhart. “The show is a tribute to Tylee, for letting us have the house,” Ms Mitchell says. As she walked around Whanganui she was struck by the amount of lion imagery, in statues or etched into glass – remnants of a colonial past and Rule Britannia. So her work and that of Mr Hurley picks up on the English colonial look and feel of Whanganui’s architecture, and the lion symbolism. Ms Mitchell and Mr Hurley are both full-time artists based in Auckland. Ms Mitchell usually paints on Perspex, however in Whanganui she chose clay, thinking to use the facilities of the Wanganui Potters’ Society on Taupo Quay. But last year’s flood had swept through the premises by the time she arrived in August last year. “When I came down [from Auckland] everything was closed because of the massive flood. I did a phone around members of the Whanganui pottery community to find some clay and see if someone could fire the works for me, get moulds [and other resources]. The research library was moving for earthquake strengthening. The whole town was in upheaval because of the flood. The local potters pitched in. She said Tony Kale, President of the Potters’ Society picked up her work and fired it for a bottle of wine; glazed firing was also organized. But the process that usually takes one and half months took two and half. You can read more about Beards, Boys, Platters, Shattered Dreams here.